There’s some debate on whether the sticky, peanut buttery, chocolate topped rice krispie bars are called “scotcheroos” or “special k bars.” Personally, I believe they are scotcheroos unless they are made with Special K cereal, and only then should they be called special k bars. Makes sense, right? Regardless of which side of the debate you land on, we can all agree the bars are delicious. This cake is next level play on the famous bars, adding a chocolate cake layer to wow your guests. It’s made in three parts: bar layer, cake layer, and then the frosting and assembly. 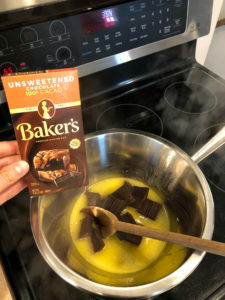 If you only have one cake pan, start with the bar layer as it can easily be removed from the pan within about a half hour. 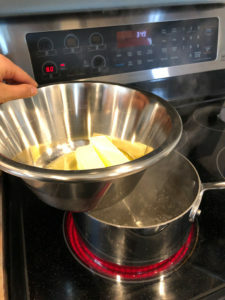 If you have two pans, start with the cake layer as it can cool while you work on the bar layer. When assembling, keep the bar layer on the bottom as it is heavier and would squash the cake layer when cutting if they were reversed. Preheat oven to 350 degrees. Spray an 8″ cake pan with oil (or use butter) and use cocoa powder to dust the inside. 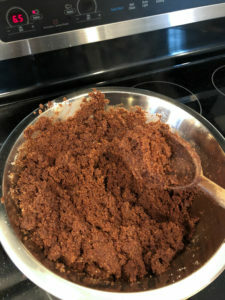 In the bowl of a mixer with the whisk attachment, mix flour, sugar, cocoa, baking powder, baking soda, and salt. Mix on low to thoroughly combine. In a separate smaller bowl, add egg, vegetable oil, vanilla, milk, and lemon juice. Whisk together. Slowly pour in hot coffee while briskly whisking so it doesn’t cook the egg. 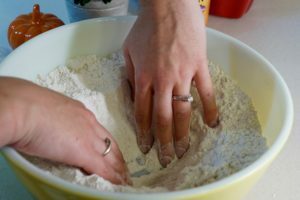 Pour wet ingredients into dry ingredients and mix until just combined, scraping edges of the bowl as needed. It will be very runny. Pour into the prepared pan and bake for about 30 minutes, until toothpick inserted at center comes out clean. Once baked, let cool for about 15 minutes and then flip onto a cooling rack, gently tapping the outside of the pan to release. Let cool completely. Grease an 8″ layer cake pan. Set aside. 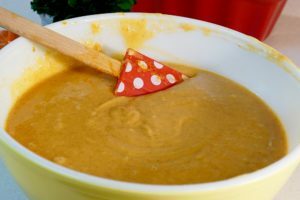 Remove from heat and add peanut butter and salt, stirring until completely melted and combined. Add rice krispies and stir until well mixed. 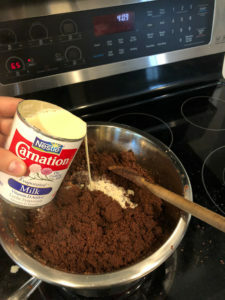 Press into prepared cake pan with greased hands. Smoothing out the top as best as you can. Let cool about 30 minutes and then flip onto a plate to cool completely. Add butter, peanut butter, and vanilla to a mixing bowl with the whisk attachment. 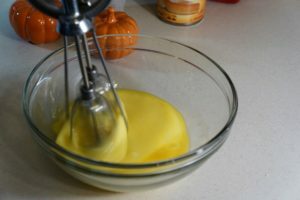 Whisk on medium speed until smooth and fully combined, scraping edges of the bowl as needed. Add powdered sugar, cocoa, and salt and mix in on low speed. It will be very dry and look like coarse sand. Beat in milk until desired consistency is reached. Beat well so it’s light and fluffy. Put a clump of peanut butter on the middle of a plate and place the scotcheroo layer on top (this keeps it from moving around). Top with frosting and a few small dollops of peanut butter, if you want. Place cake later on top. Stick three toothpicks into the cake about 1″ in from the edge (this keeps the top layer from shifting off). Frost sides first using a frosting spatula and then frost the top. Decorate by pressing rice krispies into the sides of the cake. Enjoy! I count myself lucky to have the kind of friends that give me their extra garden produce. I am especially lucky that one of these friends gave me a bag full of fresh Brookings-grown pears that were already peeled and sliced. Now that is a true friend! (Thanks Sarah!) After a bit of experimentation, I am pleased with this saucy pear cobbler with a not-to-sweet cakey topping. You could easily use apples or peaches in place of pears, though I think the ginger suits pears best. 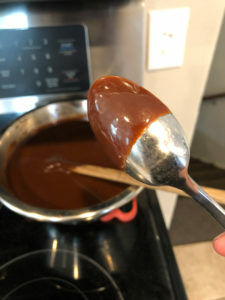 Don’t skip the caramel sauce! 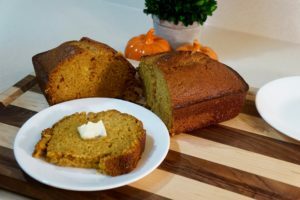 It’s from The Pioneer Woman and is so delicious. Mix remaining pear filling ingredients in a medium mixing bowl. Stir until sugar dissolves into the pear juice. Pour into the prepared baking dish. Mix cobbler topping ingredients excluding coarse sugar in a medium bowl. Stir until just combined. Spoon over pear mixture. Sprinkle with coarse sugar. Bake for 35-40 minutes or until cobbler topping is set and golden brown. You may want to put a sheet pan under the baking dish to catch any drips when the pear filling starts bubbling. Mix all ingredients in a medium saucepan over medium-low to medium heat. Cook while whisking gently for 5 to 7 minutes, until thicker. Turn off heat. Serve warm or refrigerate until cold.If sauce is thin, just continue cooking for a few more minutes. As the weather cools down, the stock of pumpkin in my pantry goes up. Pumpkin pies, pumpkin pancakes, pumpkin everything! I don’t need a Pumpkin Spice anything. Give me that straight pumpkin flavor! 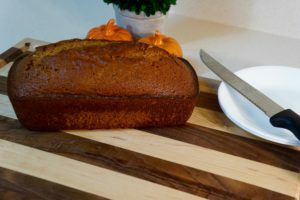 And nothing screams “FALL” to me more than pumpkin bread. My mom has only ever made one recipe, and she makes it several times a year. It makes two loaves, but with five people in the house, you would be hard pressed to find any after the first week. Not to toot my own horn or anything, but I bring this to lots of potluck events in the fall and winter, and I ALWAYS get asked if it’s homemade. It’s just that good! and 3 cups of sugar. 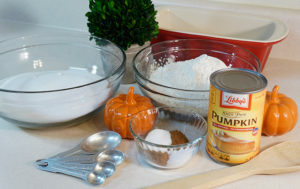 Use a whisk to carefully mix the dry ingredients together. And then use your hands to create a well in the center. 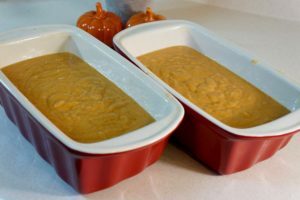 Spray two loaf pans well and divide the batter equally into both. Then, bake at 350 for one hour. If a toothpick or knife inserted in the center doesn’t come out clean after that, it might need 10-15 more minutes in the oven. Then, remove from pans and allow to cool on cooling racks before plastic wrap. Or, if you’re like me, the smell is too tempting, so just dive in & slather a slice with some butter… Yum!! The printable version is below. Leave a comment if you try it, and let us know how it tastes!